Legendary husband and wife design team Charles & Ray believed that functional modern design should be available to the masses. They also believed that their role as designers were that of grateful hosts catering to the needs of their guests. Having experimented with molded forms for years, Charles & Ray were keenly aware that the organic shapes achievable offered something new in the furniture industry. Not only could they be mass-produced, but the forms themselves offered something entirely new in design and function. Originally molded from fiberglass, and plastic later, Charles & Ray's Molded Plastic Dowel-Leg Armchair (aka DAW and "shell chair") became a 20th century icon and has embedded itself into the design culture of the 21st century. Inmod's Molded Armchair with Wood Legs is an accurately interpreted replica that emulates the molded form of the seat, styling & proportioning of its wood & steel wire base down to each intentionally created detail. Like the original, the Molded Plastic Armchair with Wood Legs is constructed of fully recyclable polypropylene. Its authentically styled base is constructed of black powder-coated steel wire and solid beech wood legs. No expense has been spared in creating a quality reproduction you can be proud of and cherish for many years. These chairs were a very easy purchase, the price is outstanding, I've bought from here before so I knew the price wouldn't reflect the quality - basically, both are excellent - I'm impressed as usual, thank you! Chose the wood base over the metal and i think it goes BEAUTIFULLY !! Happy with my choice!! The richness of the matte brown color really caught my eye in the photos and I was curious to see how it would look in person along with some of my other furniture. I have to say it's nearly identical and I'm eager to order more as soon as I return to the states. Truly a great find! Awesome!! So happy they just came and they look PERFECT, blown away by the quality for the price, thank you x10! I found the depth of the seat to be remarkably comfortable and easy to lounge in, the design sort of cradles the body and its wood paired with plastic combo is uniquely attractive - i will be buying here again in the future! 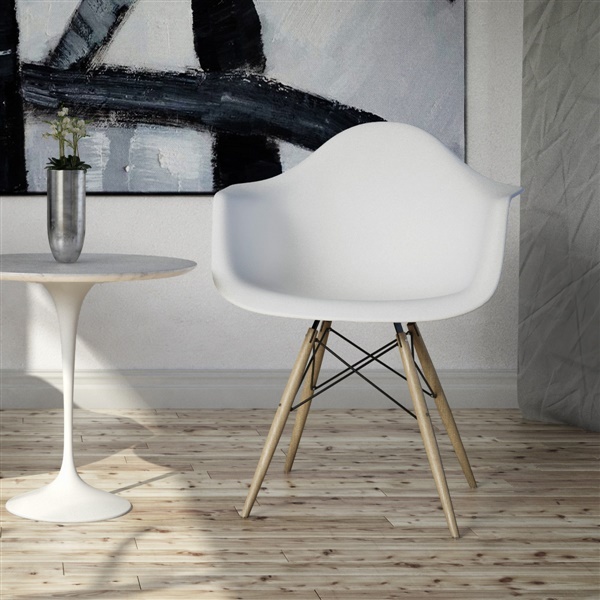 I was so delighted to find this chair with wooden legs, i've seen it with metal legs but my living room has mostly wooden base and frame furniture, it fits absolutely perfectly with the rest of the design, thank you! Ultra modern design! Chairs just arrived and they are in perfect condition. Customer service was very helpful! Great and exactly what we were looking for. Aside from the fact that these are very comfortable they're the perfect contrast between the dark seat and light base. It's hard to purchase furniture sight unseen but I'm so glad I did it. ProsMade well for a great price. Loving the look. 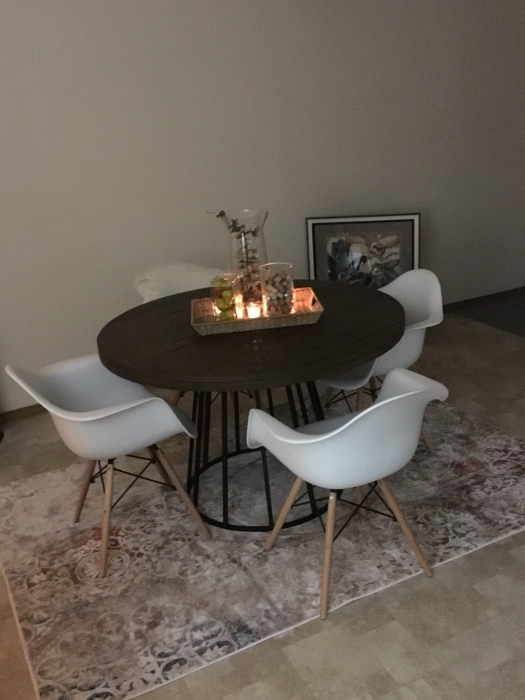 I love my modern dining room chairs! I ordered 4 chairs for my round dining room table. They are excellent quality, easy to put together and the matte finish is great. I originally ordered the ones without arms and they just seemed too small. Shipping was quick and when some chairs came in damaged they helped me resolve the situation right away. They are very comfortable too...I put sheepskin furry throws on two of them so you get a cozy little seat too! These chairs are commercially rated and are rated for use up to 250 lbs. How is it shipped? Are the legs separate from the seats? So therefore you can stack the seats together? This chair comes packaged 2 per box. The seats are nested and you will have to attach the legs when you receive them.